On Friday 4th January 2019, tension filled the dawn air at the Haven Centre as MBCF staff and visiting Haven members got to grips with the final arrangements for hosting six specialist medical camps all running together. There was a lot to do to ensure the long day ahead would run smoothly and the nervous energy displayed by the many young volunteers from the Haven Academy, 24 in all, so keen to do their part, was also evident. However, once the true professionals took over the real work of the day, our tensions disappeared and a calmness descended. So much so, that we insisted they pause for a well earned break, take centre stage and accept a round of huge applause during our midday cultural show. From left to right, wearing their Haven lanyards and a traditional token of our appreciation over their shoulders, our esteemed panel of specialist doctors: Professor Bimal Bhadhuri for Paediatrics and the Chair of Haven's Medical Board, Professor Chitta Chowdhury for ENT, Dr Sunil Roy for General Medicine, Dr Atanu Dutta for Paediatrics, Dr Suman Biswas for Ophthalmology, Dr Santanu Bag for Neuro Paediatrics, Dr Manas Chakrabarti for Gynaecology, Dr Abir Pal our RMO for MBCF. With three consultant Paediatricians on board, it seemed fitting to make the theme of our cultural show all about children, and, unlike any other past project articles relating to medical camps that feature on the Haven website, the cultural show is where this project article begins. 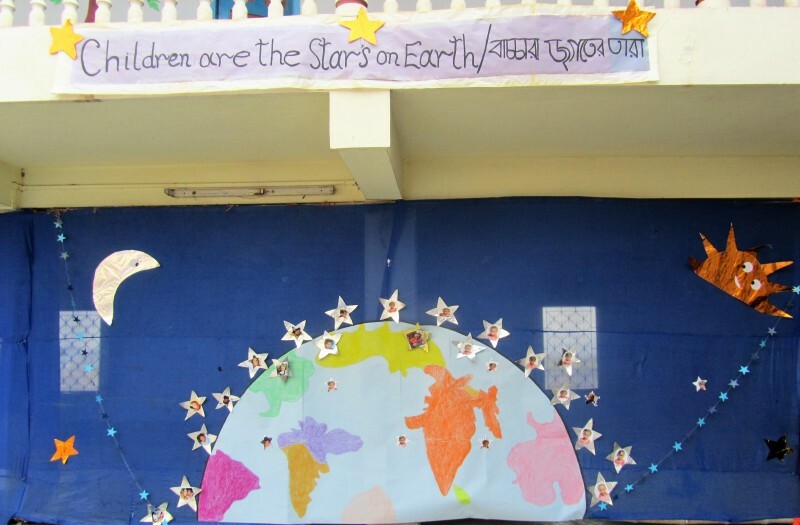 All the performances were loosely based around the title of an acclaimed Indian film, "Taare Zameen Par", (titled Like Stars on Earth internationally). Aamir Khan, who directed the film, has said "Taare Zameen Par is a film about children and it is a film which celebrates the abilities of children. Taare Zameen Par is a title which denotes that aspect. It is a title with a very positive feel to it. All the kids are special and wonderful. They are like stars on earth. This particular aspect gave birth to the title." And, with this in mind, our children with disabilities were asked if they would like to perform a sequence of their own. Those who were able to communicate verbally answered with a resounding "YES!" and those who could not verbalise, indicated their pleasure by excitedly reaching out for the colourful ribbons that were to be used in the show. Latika Das, one of our two learning centre teachers, took on the painstaking task of choreographing all the numerous dance sequences. The children with disabilities had to attend their rehearsals with her, just like all the other performers. They had specifically created costumes necessary for their sequence, again like all the other performers. 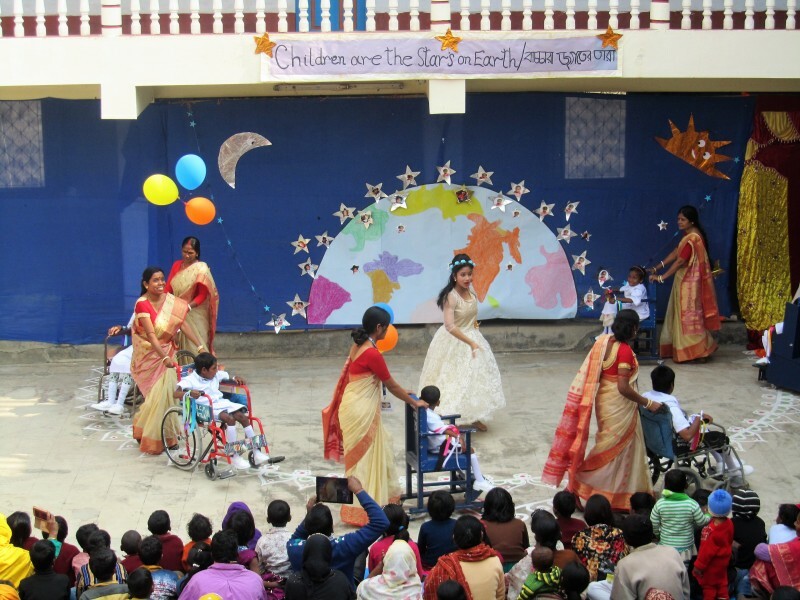 Our children with disabilities were not treated any differently and were not given any special part to play; they were taken as part and parcel of the whole community of performers, each and every one with a valuable role in the show. 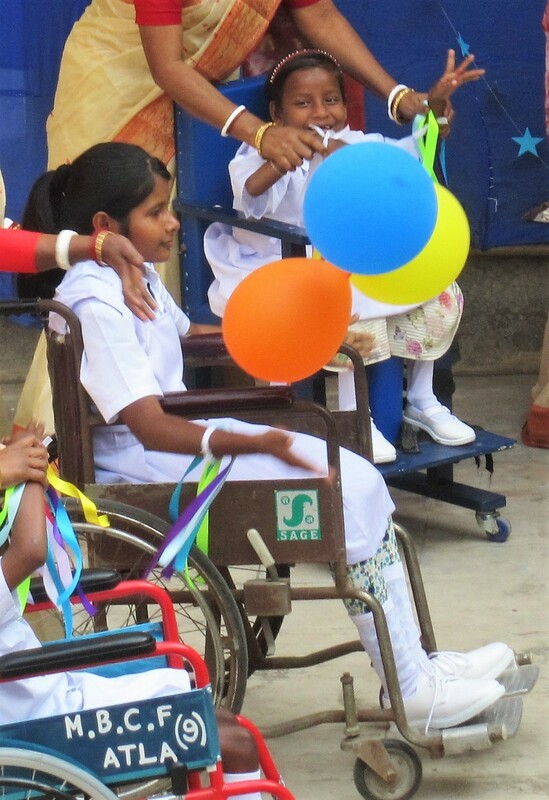 It was heartwarming to watch the children with disabilities so engaged, fully integrated and included in their own right because THEY wanted to be. Those who were able to, waived their hands so that the brightly coloured wrist ribbons fluttered in the air, adding much to the radiant feel of their performance. And, as to whether the children enjoyed their experience, their smiles say it all! The song that accompanied their performance was extremely touching and brought a lot of tears to many in the audience. In writing the song "Taare Zameen Par," lyricist Prasoon Joshi followed the theme of "however much you talk about children, it's not enough." Every line throughout the song describes children, and only one repeats: "Kho Naa Jaaye Yeh / Taare Zameen Par" ("Let us not lose these / Little stars on earth"). Dr Atanu Dutta has been a long standing, committed Haven supporter and always provides us with essential back up, whether it's at the centre or in the UK joining in our fundraising activities. 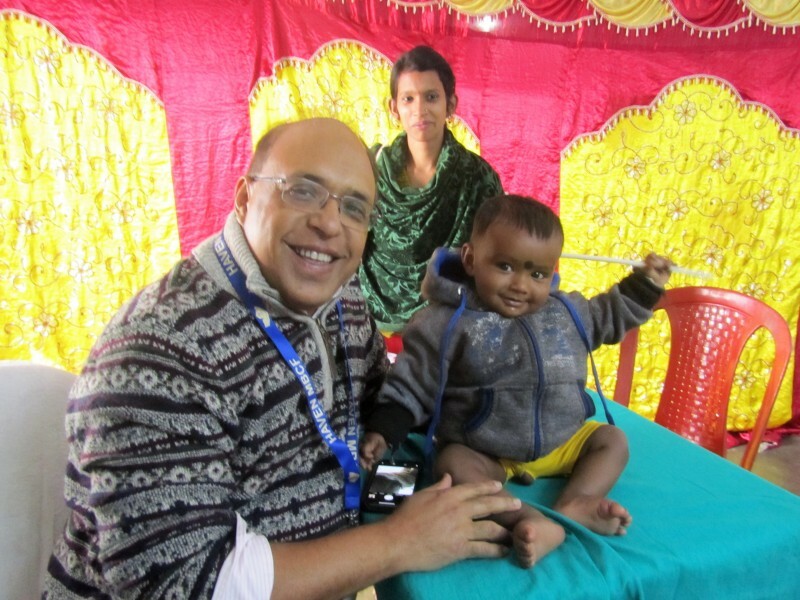 This was a fourth visit to Atla for Dr Dutta to run the Paediatric Camp on the day. His gentle manner during consultations and ever cheerful, beaming face put all the children at ease, and all the patients left with smiles. With his considerable medical expertise, Dr Dutta provided essential care to 55 patients and put forward two for referral. Both referral cases are surgical ones and Haven has already put plans into action as both need to be dealt with as soon as possible to avoid further complications. Dr Santanu Bag is based in Kolkata, India and his specialism is in Neuro Paediatrics. He has been our well established port of call for a number of complicated procedures for referall patients from Haven; this was his second time running a Neuro Paediatric camp at our centre. Dr Bag's solicitous care for the 25 patients that he saw during the day was seen in the calm showed by scared children and their families as they spent time in his consulting room. Each consultation took a long length of time as many easy to miss details needed to be discussed before an appropriate course of action could be decided on. More than 10 children were put forward for referral, mostly requiring MRI brain scans. Haven and MBCF will ensure these are completed at the earliest. Professor Bimal Bhadhuri has become a regular feature at the Haven Centre and has taken charge of our numerous Paediatric camps in the past. 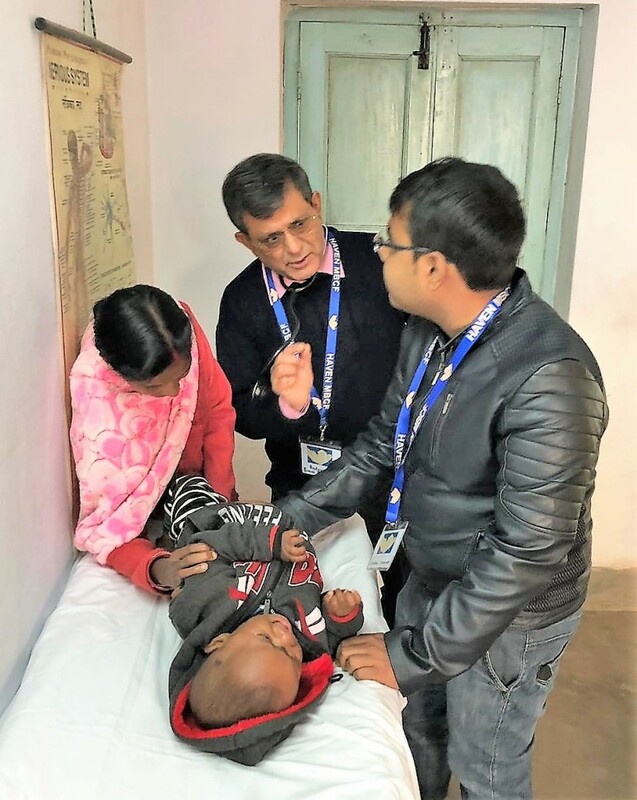 On this occasion, as both Dr Dutta and Dr Bag were overseeing the two Paediatric camps, Haven requested Prof Bhadhuri to take on a very different role this time, whilst still being on hand for any patient consultations that may be required by the other two Paediatricians. What we really needed from him was his professional advice on how to improve our standards in terms of logistics, efficiency, patient care and overall management. 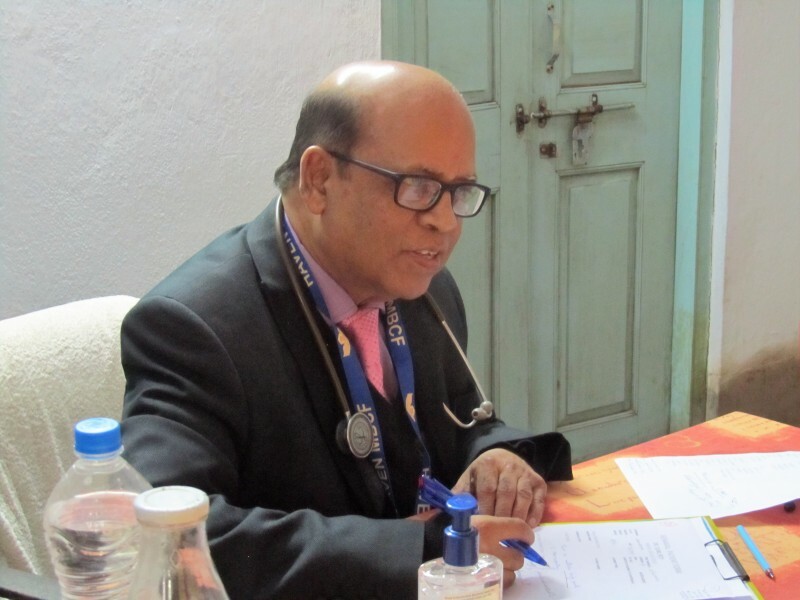 This advice would be invaluable to Haven and MBCF for all our future medical camps and normally there just wouldn't be the time for Prof Bhadhuri to play this role of a critical appraiser. So, we were delighted when he agreed and a list of improvements has already been collated for future reference. During the day, Prof Bhadhuri managed to find the time to don his "teaching hat" and pass on essential guidance to Subham Sarkar, a former MBCF Youth Group member, who has aspirations to become a doctor. 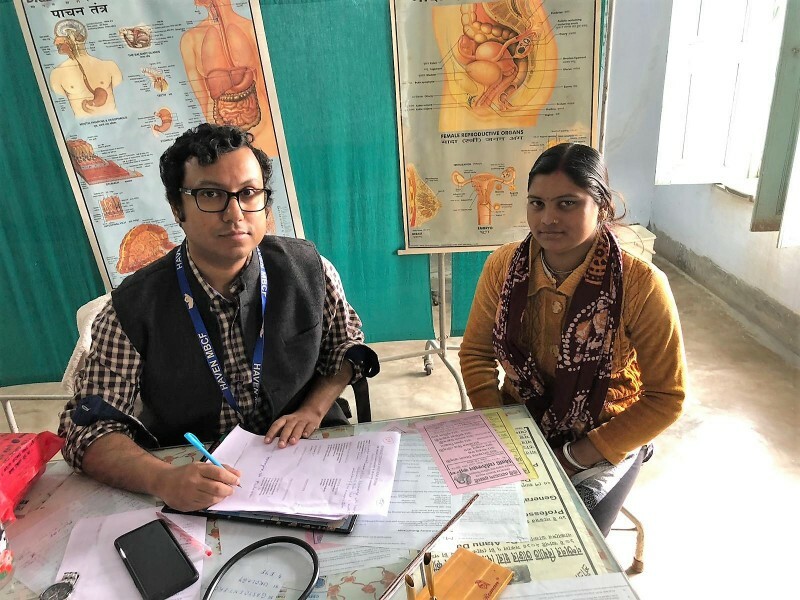 On his second visit to our centre, Dr Manas Chakrabarti took charge of the Gynaecology Camp and, with his sensitive, professional manner, helped put every one of the 55 patients at ease. Dr Chakrabarti's considerable knowledge and skills meant the women received the highest levels of care and treatment. Arriving with trepidation, most of the patients left with smiles and a new found sense of relief and comfort. Five patients have been put forward for referral, out of which there are two serious cases. Haven will ensure these two women get the urgent attention they need at the earliest. Arpita Chakrabarti, Dr Chakrabarti's wife, kindly volunteered to act as manager of the Gynaecology and General Medicine Camps. She was assisted by Rina Basak, a first time visitor from Kolkata, and together they ensured both camps ran smoothly. Our sincere thanks to both of them for their most helpful support throughout the long day. Professor Chitta Chowdhury, on his fourth visit to Atla, ran the ENT camp single handed at the Haven Community Centre. He has been championing Haven's cause for a long time and has always supported our work on the ground. His considerate and caring manner allowed all the patients to feel completely at ease at all times. 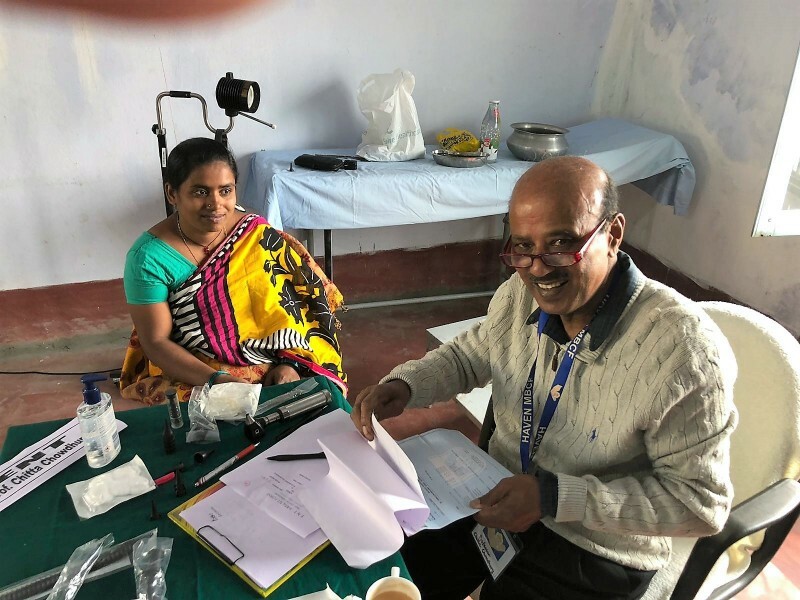 With his excellent diagnostic skills, the camp was conducted most efficiently and Professor Chowdhury was able to help 68 patients and advised 15 patients for further referral. 8 of the referral patients will have hearing tests conducted at the centre and will most likely require hearing aids to be fitted. 4 of the referrals are surgical cases, 2 involving throat tumours and 2 requiring tympanoplasties. With 115 patients, Dr Suman Biswas, on his very first visit, certainly had his work cut out. It soon became apparent to us all that he was more than able and the Ophthalmology Camp was run in an effective manner. Dr Biswas is a Consultant Ophthalmic surgeon and specialist in glaucoma and complex cataract surgery. After completing basic medical training from the prestigious JIPMER in Puducherry, India, he obtained Fellowship of the Royal College of Surgeons of Edinburgh and the Royal College of Ophthalmologists, London. He is also a doctorate in research and is active in training eye specialists in the UK as a College Tutor. Besides a busy clinical practice, he is actively engaged in various medical charities worldwide. Thanks to Professor Bhadhuri's genuine endeavours in support of Haven's cause, Dr Biswas is the newest recruit to Haven's medical board. The quality of his exceptional care of the patients on the day spoke volumes about Dr Biswas and his work ethics. 20 referral cases have been put forward and Haven has already completed the necessary follow up treatment for those requiring cataract operations. Two of the referral cases involve very serious cornea surgeries and they have already been referred on to the Disha Eye Hospital in Burdwan, West Bengal. Haven and MBCF will ensure these surgeries are dealt with at the earliest to avoid any further worsening of our patients' conditions. Making his fourth trip to Atla, Dr Sunil Roy took on one of the busiest camps of the day: the General Medicine Camp. Patient care is at the top of Dr Roy's priority list and despite the large number of patients, 95 in all, who had been waiting from the early hours of dawn, Dr Roy remained calm throughout and afforded every patient with time and consideration. His cheerful personality and approachable nature did much to ease the patients' concerns during their consultations. 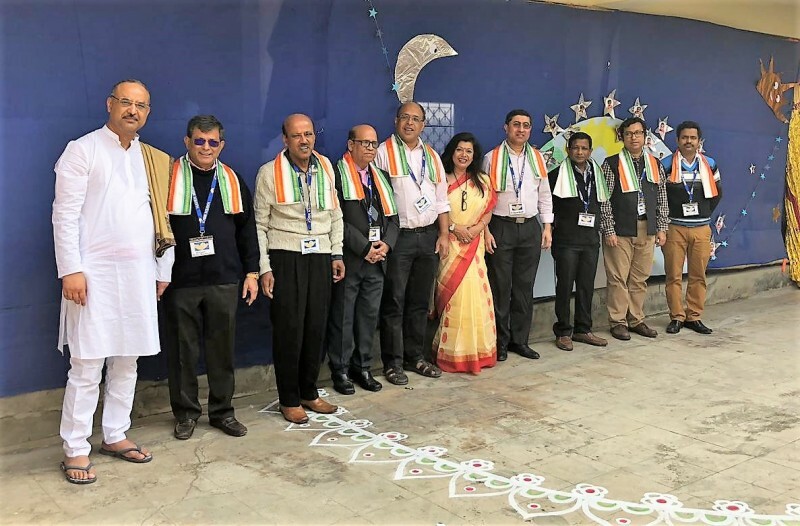 Aided by our RMO, Dr Abir Pal, and with his excellent diagnostic skills, Dr Roy was able to conduct the General Medicine camp most effectively. There were two referrals: one for further tests to determine Diabetes and the second for a biopsy of a throat tumour. Dr and Mrs Roy also very kindly sponsored the midday meal for 800 people, including all the patients and their families and carers, many of whom had travelled for long hours from far and wide. Haven would like to extend heartfelt thanks to the entire medical team for their dedication and sincere commitment. Their generosity of spirit and kindness is something we will long remember as will all the patients who's lives have been changed forever thanks to the time given by all the doctors. In other news, major refurbishment works had been completed by the end of December 2018 so that everything would be ready at the centre in time for the January 2019 camps. To improve efficiency of all our future medical camps, Haven decided to convert one of the centre’s upstairs washrooms. We noticed how large an area this cloakroom was and yet how inefficiently it was being used. Until now there have been just four bathrooms served with hot water and we became aware that visiting doctors were having to wait to get ready. Now fully refurbished, with new plumbing and two modern geysers providing hot water, this large cloakroom today houses two shower cubicles, two toilets and two washbasins. 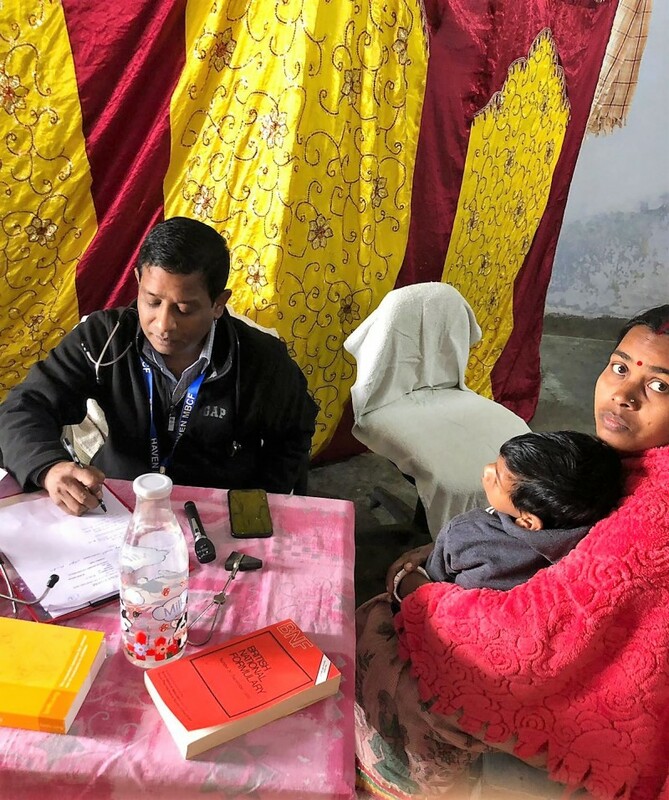 Waiting time at this January's camp was drastically reduced thanks to this efficient usage of space thereby allowing everything to begin as per schedule and ensuring a smooth outcome for all the medical camps on the day. Throughout rural India there is an acute shortage of affordable healthcare, energy sources, clean water, and education. The washing facility, whilst still providing the villagers with clean water for drinking, bathing and washing, needed complete renovation after being so heavily used over 12 years since we built it, back in 2006. Work started on site following our November 2018 medical camps and the washing facility is now totally transformed with heavy duty, waterproof shower cubicle doors to replace the water damaged broken ones, brand new plumbing and taps and modern tiled paving to all areas within the facility. Visitng doctors and Haven members went along to inspect the newly refurbished washing facility and we were delighted with the high standard of finish as were the many villagers who greeted us with big smiles to thank us for this essential, life improving amenity they benefit from on a daily basis. Our biggest thanks must and always go to our loyal team on the ground: the MBCF staff and all the volunteers from the Haven Academy and from the local area. Our essential work continues in the depths of rural West Bengal solely due to their dedicated and tireless support. This vital, caring community in Atla is an intrinsic part of Haven and one we always feel at home with.